Asthma is a chronic inﬂammatory disease of the airways characterized by hyper-responsiveness, mucosal edema, and mucus production. This inﬂammation ultimately leads to recurrent episodes of asthma symptoms: cough, chest tightness, wheezing, and dyspnea. Patients with asthma may experience symptom-free periods alternating with acute exacerbations that last from minutes to hours or days. Asthma, the most common chronic disease of childhood, can begin at any age. The main triggers for asthma are allergies, viral infections, autonomic nervous system imbalance that can cause an increase in parasympathetic stimulation, medications, psychological factors, and exercise. Of asthmatic conditions in patients under 30 years old, 70% are caused by allergies. Three major indoor allergens are dust mites, cockroaches, and cats. In older patients,the cause is almost always nonallergic types of irritants such as smog. Heredity plays a part in about one-third of the cases. 3. If not treated promptly, status asthmaticus – an acute, severe, prolonged asthma attack that is unresponsive to the usual treatment – may occur, requiring hospitalization. 1. 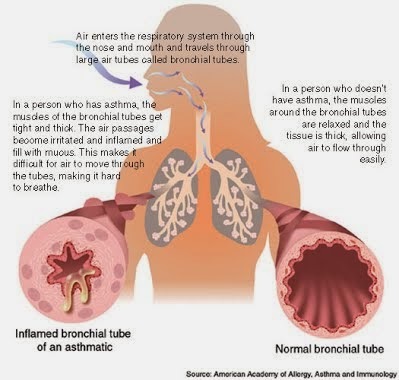 Extrinsic Asthma – called Atopic/allergic asthma. An “allergen” or an “antigen” is a foreign particle which enters the body. Our immune system over-reacts to these often harmless items, forming “antibodies” which are normally used to attack viruses or bacteria. Mast cells release these antibodies as well as other chemicals to defend the body. 2. Intrinsic asthma – called non-allergic asthma, is not allergy-related, in fact it is caused by anything except an allergy. It may be caused by inhalation of chemicals such as cigarette smoke or cleaning agents, taking aspirin, a chest infection, stress, laughter, exercise, cold air, food preservatives or a myriad of other factors. Most common symptoms of asthma are cough (with or without mucus production), dyspnea, and wheezing (ﬁrst on expiration, then possibly during inspiration as well). Asthma attacks frequently occur at night or in the early morning. An asthma exacerbation is frequently preceded by increasing symptoms over days, but it may begin abruptly. Chest tightness and dyspnea occur. Additional symptoms, such as diaphoresis, tachycardia, and a widened pulse pressure, may occur. Exercise-induced asthma: maximal symptoms during exercise, absence of nocturnal symptoms, and sometimes only a description of a “choking” sensation during exercise. A severe, continuous reaction, status asthmaticus, may occur. It is life-threatening. Eczema, rashes, and temporary edema are allergic reactions that may be noted with asthma. Family, environment, and occupational history is essential. During acute episodes, sputum and blood test, pulse oximetry, ABGs, hypocapnia and respiratory alkalosis, and pulmonary function (forced expiratory volume [FEV] and forced vital capacity [FVC] decreased) tests are performed. There are two classes of medications—long-acting control and quick-relief medications—as well as combination products. The immediate nursing care of patients with asthma depends on the severity of symptoms. The patient and family are often frightened and anxious because of the patient’s dyspnea. Therefore, a calm approach is an important aspect of care. Assess the patient’s respiratory status by monitoring the severity of symptoms, breath sounds, peak ﬂow, pulse oximetry, and vital signs. Administer medications as prescribed and monitor the patient’s responses to those medications; medications may include an antibiotic if the patient has an underlying respiratory infection.